Are you looking for a detailed listing of New Jersey Art & Craft Shows, Fairs & Festivals? See our featured fair listings with detailed information for Craftsmen, Artists , Food Vendors & Resellers. If you like what you see, treat yourself to a subscription instead of spending your time hunting for shows! WE do the research so you don't have to! Nobody does it better. See our featured listings below! (Don't you want hundreds more?) Subscribe now! 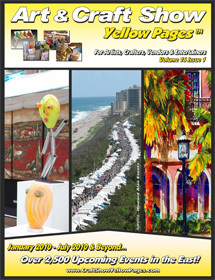 Subscribe to Art & Craft Show Yellow Pages for 1000s more great events! Leonia, NJ: Leonia Summer Craft Fair & Car Show at 399 Broad Ave at the American Legion. In/outdoors, 40 spaces, free admission 10:00-4:00, Handmade crafts, screened by 2 photos, 1 of display. Classic car show, Italian ice, and fun for the kids. Still accepting craft vendors--e-mail us for an application. Handmade items only. No resale items. 10x10', 8x8', $60-$70. Upper Montclair, NJ: Fine art & Crafts at Anderson Park, outdoors 10:00-5:00, free Adm. Juried show of 180 professional artists, photographers and crafts people. Juried by 3 slides or photos and one of display. Food vendors 20% Comm., 26 yrs, 10x12' - 10x24', $330-$660 security, printed programs. Jury fee $20 before 1/15, $25 after 1/15. Easy setup/break down. Food vendors 20%. Online application. Glen Rock, NJ: 4th Annual Autumn Craft Street Fair, on Rock Rd., 11:00 - 4:00, free admission. Outdoors: 100 spaces, handcrafted work only, juried by 3 photos, 1 of display. 10'x12', $140, Food vendors $250. 8,000+. Application online. Colts Neck, NJ: Colts Neck Art & Craft Festival at the Colts Neck Fairgrounds, Bucks Mill Rd, Sat & Sun., 10:00-5:00, Adm. $5. 180 spaces, in large tents supplied by the promoter. Arts & crafts, juried by 3 photos, 1 of display, live music, food. Security, food, tables, chairs, $360 10x10'. Food vendors, $325. Elec $50. 14 yrs, 8,000 last yr. Application online. Cranford, NJ: Fine Art & Crafts at Nomahegan Park, outdoors, 10:00-5:00, free Adm, 120 spaces: fine art, crafts, food, juried by 3 slides or photos, 1 of display. Printed programs. Food Vendors call, security, 10x12-24, $330-$660, easy setup/break down, 21 yrs 10-12,000, Online application. Hillsdale, NJ: Artistic Creations in the Park. Outdoors, 10:00-4:00, free Adm., fine art, crafts, juried by 2 photos, 1 of display. Original work by exhibitors only, 10x10'-20', 4 yrs., 1,000+ last yr, application online. Montclair, NJ: Fine Art & Crafts at Brookdale Park on Watchung Ave: Outdoors 10:00-5:00, free Adm., Juried show of professional artists, photographers and crafts people in lovely county park, easy set-up and breakdown. Juried by 3 slides or photos and one of display. Food vendors 20% Comm., 21st yr, 12-18,000 last yr, 10x12' - 10x24', $330-$660 security, printed programs. Jury fee $20 before 1/15, $25 after 1/15. Easy setup/break down. Food vendors 20%. Online application. Millburn, NJ: Art Fair 2009 on Millburn Ave., free admission, 11:00-5:00, outdoors, 120 spaces, fine art, crafts, Juried by 3 sl/photos, or digital images on CD. Kid's Corner, entertainment, food court. 10'x10', $100, 30 yrs. No food vendors. Whitehouse Station, NJ: Spring Craft Show at 271 Main Street, indoors: 10:00-4:00, Adm. $1. 49 spaces, arts, crafts by creator only, refreshments, bake sale. 6'x10', 9x7', $45. Elec. $5, tables $5, chairs n/c., 1,000 last yr, online application. Wayne, NJ: 10th Crafts at Wayne Hills, Wayne Hills High School, Verdan Ave., 10:00-5:00, admission $3. Handcrafted work only, juried by 3 photos and 1 of display. 8'x10', 4'x16', $90. 1,500 last yr. Application online. If you sell your product at fairs, festivals and craft shows, you need 1000s of show listings from our craft show directory so you can choose the right ones for your product! AND you instant access now! 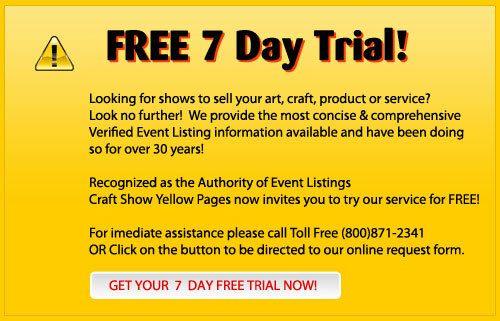 - Subscribe to Art & Craft Show Yellow Pages TM the directory of event information for Craftsmen, Artists , Food Vendors & Resellers.